The Bubble Show is back in town! This time at the amazing BATS Theatre and featuring even larger bubbles than ever before! Join Mr. Bubbles with his beautiful soap bubbles in all shapes and sizes! Enjoy bouncy bubbles, bubbles inside bubbles, smoke bubbles, square bubbles, giant bubbles and even fire bubbles! The Bubble show is interactive and suitable for all ages. Children and adults all enjoy the magical bubbling. 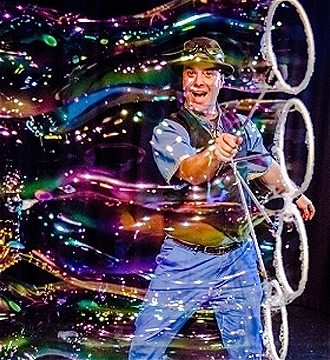 The show is a unique blend of Magic, storytelling and Bubble-Art! Join us as we journey together through the realms of Bubbland!